Mako robotic-arm assisted hip and knee replacement surgery is cutting edge technology that provides each patient with a personalized surgical plan based on the unique anatomy of their hip or knee. It has been developed in the United States and has recently introduced to Australia. Dr Limbers is one of the first surgeons in Australia to use this technique. Mako robotic surgery can be used for partial (unicompartmental) knee replacement, which is a procedure designed to relieve pain caused by joint degeneration due to osteoarthritis in one compartment of the knee. By selectively targeting the part of your knee damaged by osteoarthritis, Dr Limbers replaces the diseased part of your knee while sparing the healthy bone and ligaments surrounding it. The Mako technology provides Dr Limbers with a patient specific 3-D model to pre-plan your partial knee replacement. During surgery, he guides the robotic-arm (Figure 1) based on your patient-specific plan. This allows him to remove only the diseased bone, preserving healthy bone and soft tissue, and assists him in positioning the implant based on your anatomy. Prior to surgery a CT scan of your knee is performed and is used to generate a 3D virtual model of your knee. 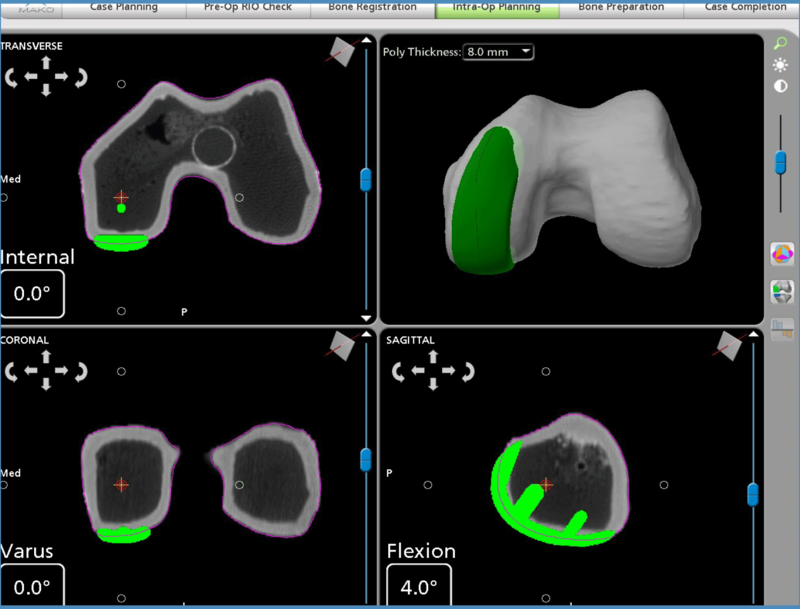 This virtual model is loaded into the Mako system software and is used to create your personalized pre-operative joint replacement plan. In the operating room, Dr Limbers performs a minimally invasive approach to your knee and inserts navigation pins into the femur (thigh bone) and tibia (shin bone). He then maps the anatomy of your knee joint with a specialised probe. This information, together with data from the navigation pins, is detected by a specialised camera. This is then entered into the Mako robotic unit. This allows adjustments to the surgical plan based on additional detailed information obtained during surgery. The Mako system then guides Dr Limbers within the pre-defined area while he prepares the bone for the implant (Figures 3&4). 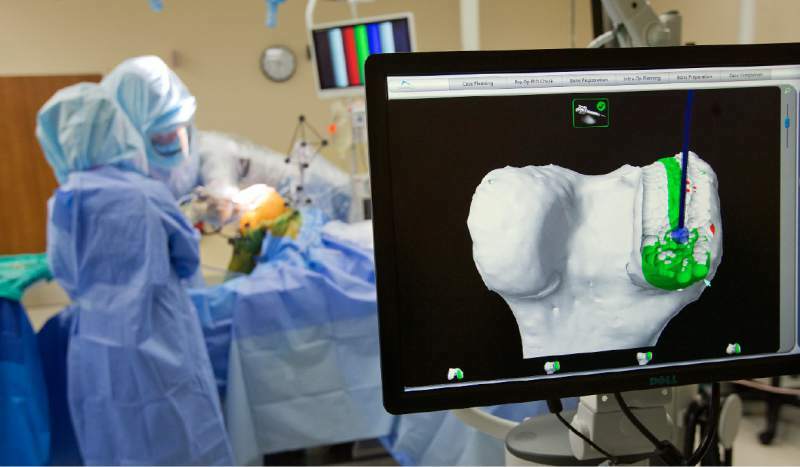 The tactile, auditory and visual feedback of the robotic arm limits the bone preparation to the diseased areas and allows real time adjustments. This technique provides highly accurate placement and alignment of the components of the partial knee replacement. After the bone preparation Dr Limbers implants the metal femoral and tibial components with a polyethylene insert between the components. At the end of the surgery, local anaesthetic is injected into the wound for pain relief. The wound is then carefully closed and covered with a waterproof dressing. Typically, you will remain in hospital for 1 night then be discharged the next day after seeing the physiotherapist. Your physiotherapist will set goals with you to get you back on the move. You will have outpatient physiotherapy after discharge. Your physiotherapist will closely monitor your condition and progress. Dr Limbers will review you with an X-ray of your new partial knee replacement in his rooms after 6 weeks. Most of the recovery will be obtained in the 1st 6 weeks, with further recovery continuing for several months beyond that. The post-operative pain is less and the recovery quicker than with a full total knee replacement. Medium term data of robotic partial knee replacement suggests a significantly lower incidence of premature failure, when compared to traditional instrumented partial knee replacement techniques. It results in a more rapid recovery and shorter hospital stay than traditional total knee replacement surgery, as well as a more natural feeling knee following surgery.